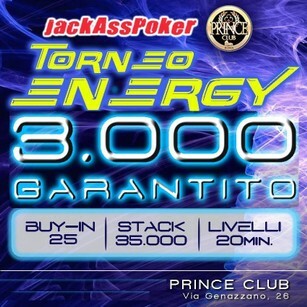 PRINCE CLUB - UNDER THE GUN 1.000 GARANTITI!!! - Texas Holdem Poker - Tornei Live di Poker a Roma. PRINCE CLUB - UNDER THE GUN 1.000 GARANTITI!!! Max 1 Reentry in AVG!!! - Bonus +10.000 STACK PUNTUALITA' entro le 22.30!! - NUOVA CLASSIFICA "TANA DELLE TIGRI - CLUB EDITION!!" Per tutta la notte prive 0.5/0.50 DI FUOCO!! con JACKPOT ORARIO! !